The Mahlke Chronicles: I know a boy. I know a boy. This boy is sweet. He covers owies with bandaids, offers beloved loveys to crying siblings, holds doors, covers his baby sister with millions of kisses a day, and often gives up what's his to appease his brother. I know a boy. This boy is silly. He dances without inhibitions, his body bobbing and thrashing. He tells jokes with no punch lines, each variation making less and less sense, yet eliciting more and more giggles. His baby sister laughs hardest for him, watching as he blows bubbles, listening as he makes obnoxious noises, then erupting into deep belly laughs. I know a boy. This boy is smart. He sits on his floor surrounded by teeny tiny Lego parts and a booklet of directions, and constructs cars and rockets and trucks. He sits at the table, hunched over a worksheet, methodically sounding out words; and although the sounds don't come naturally and automatically to him, he persists. I know a boy. This boy is sensitive. He feeds off the moods and energy around him. Stimuli can overwhelm him, and self-regulation has always been a work-in-progress. I know a boy. This boy just turned seven. 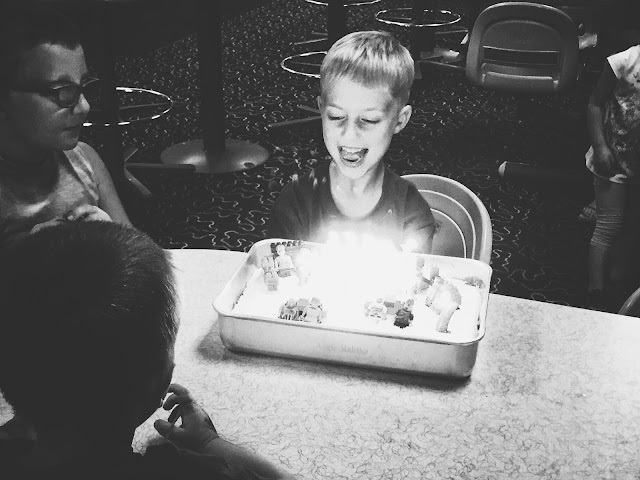 He celebrated his birthday with a few family and friends at a bowling alley. He chose the theme of Legos. I know a boy. His name is Spencer, and he is my son, the one that made me a mom. I know a boy, and he is all of these things and many, many more. He cries easily and laughs often. He's stubborn and persistent. He is aware of his limitations, but he fights hard to push past them. He sometimes follows when he shouldn't, but he has a pretty decent sense of right and wrong. He takes to change slowly, preferring the gradual dipping in of the toes approach. He is small for age, but has a whole lot packed into that little body. His favorite things aren't typical, and I love his uniqueness. I hope he always embraces his true self, even in a world that covets sameness. I know a boy. He is mine. And I love him so.